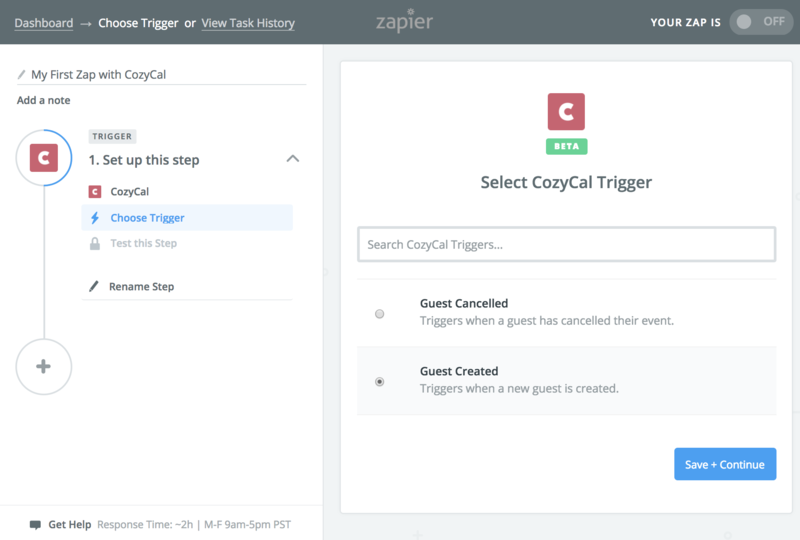 Recently, we launched Zapier integration beta on CozyCal. Now you can create different zaps between CozyCal and 500 other apps. 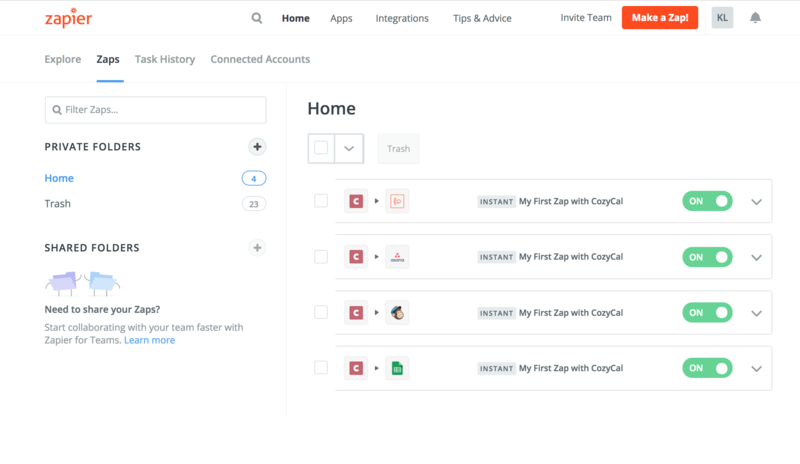 The reason we added Zapier integration to CozyCal is to offer you an easy and quick way to automate repetitive or tedious tasks in your workflows. 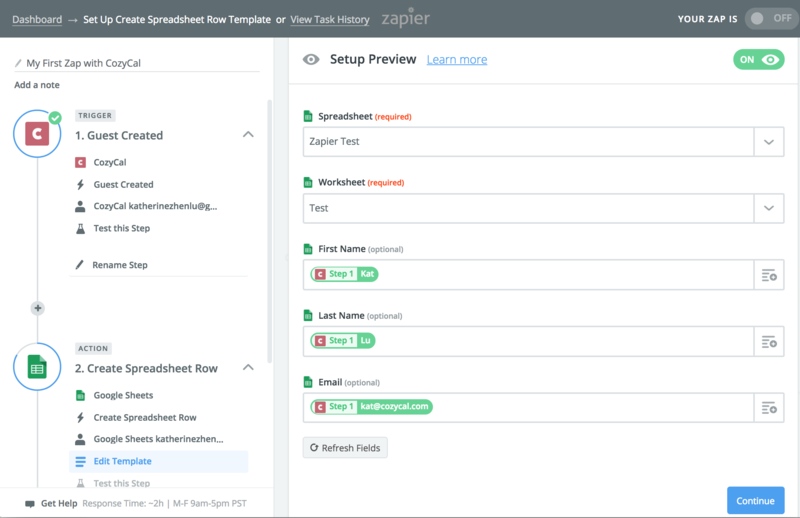 More importantly, by automating more tasks through zaps, it will free up more time in your schedule to focus on other aspects of your business such as generating leads, maintaining relationship with your clients, and boost business revenue. 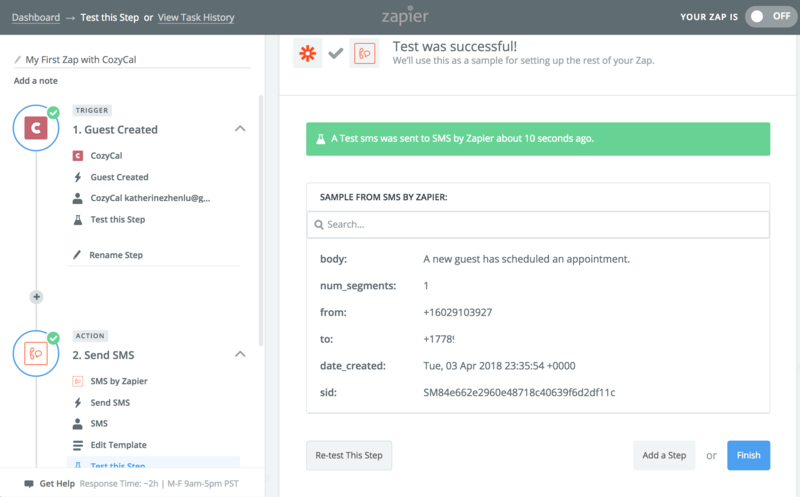 For those of you who are unfamiliar with Zapier or what a Zap is. A zap is a connection between two apps made of a trigger and an action. When the trigger event happens, Zapier will make the action event happen automatically for you. Each time when the trigger and action event happens, a task is completed. 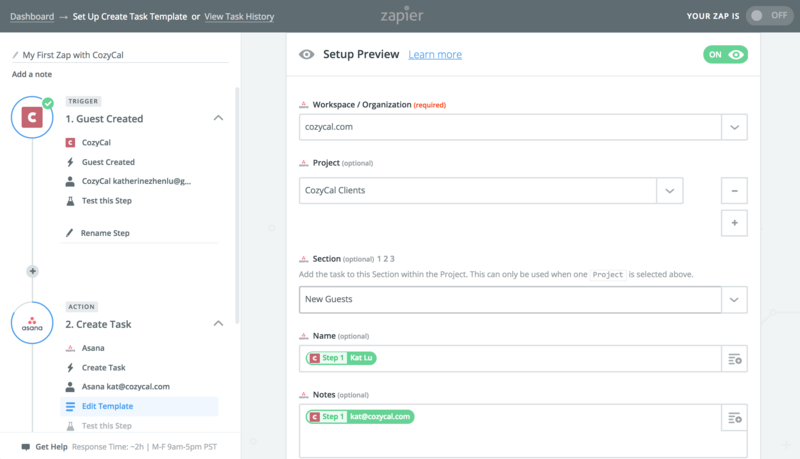 With Zapier, it's easier to connect CozyCal with other apps that you use to run your business. By creating these zaps, new processes can be built to make things more organized, automated and streamlined. Before we start going over these zaps in details, I want to clarify that Zapier has a tiered pricing scheme as some users have asked us whether Zapier is free or not. For their free plan, you can only create four single-step zaps with 100 tasks per month. With their paid plan, you can create 20 multi-step zaps with 1,000 tasks per month. In this post, I will be sharing with you single-step zaps between CozyCal and four other apps. 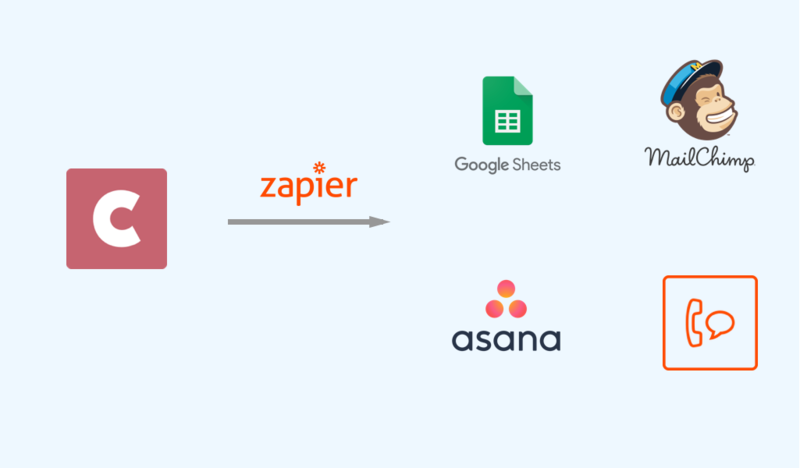 However, if you have a paid Zapier account, you can definitely take the creative license and build multi-step zaps that automate your workflows according to your business's unique needs. 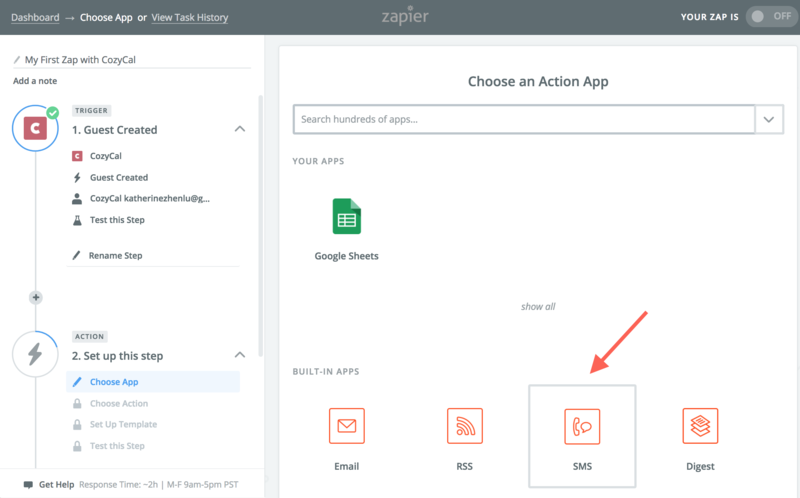 To see an example of how to create multi-step zaps for an onboarding process, check out this article. To access Zapier integration, first log into your account first and then go to your booking page. If you manage your client list in a Google spreadsheet, you can zap CozyCal with Google Sheets to track new clients who are scheduling appointments. 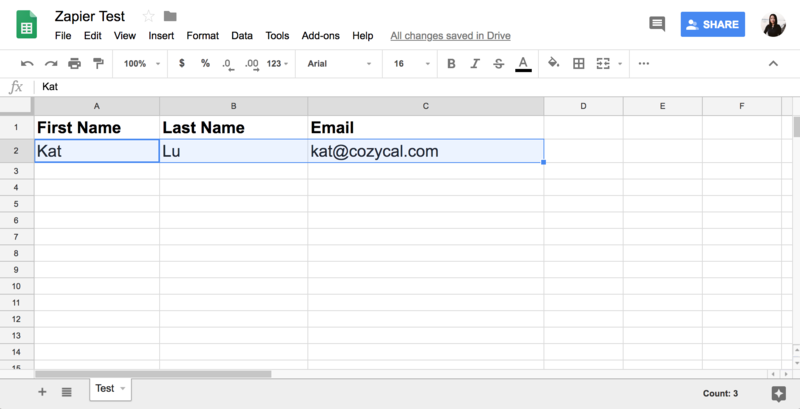 Tip: Before you zap CozyCal and Google Sheet, first create the right column headers in your Google Sheet. In this case, "First Name", "Last Name" and "Email" are created in the Google Sheet. Step 4: Finish and turn on the Zap. New rows will be created for new guests automatically in the Google Sheet. 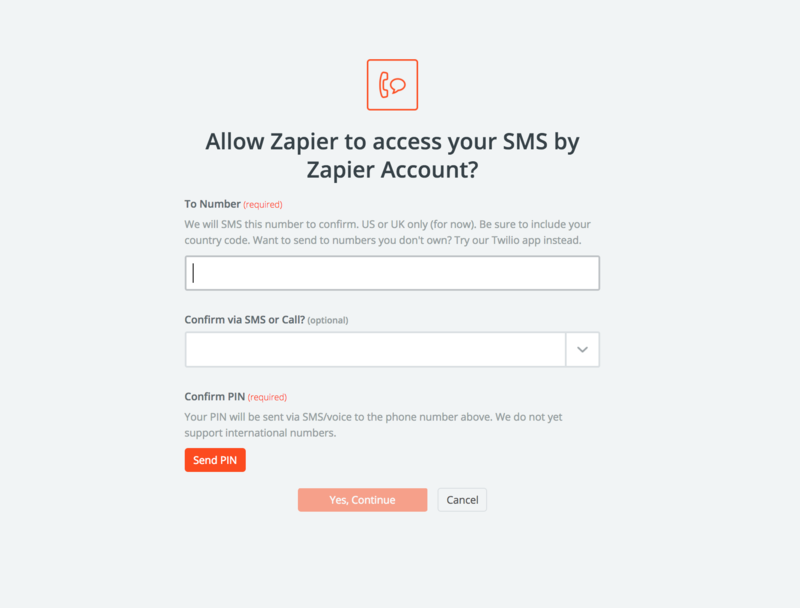 If you want to receive a text message when a new guest books or cancels the event in CozyCal, you can zap CozyCal with Zapier's in-house SMS app. A quick reminder that receiving SMS notifications are only available in the US, Canada and UK now. Step 4: Finish and turn on the zap. 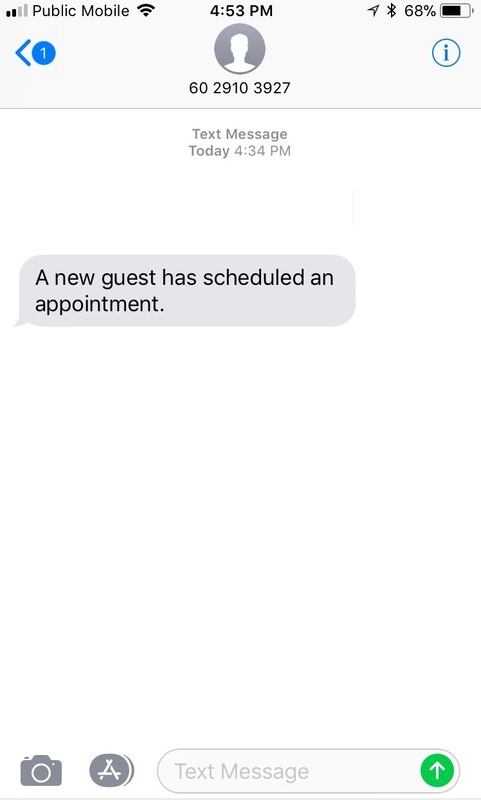 You will receive a text message when a new guest schedules an appointment. Asana is a collaborative information manager that helps to organize people and tasks effectively. 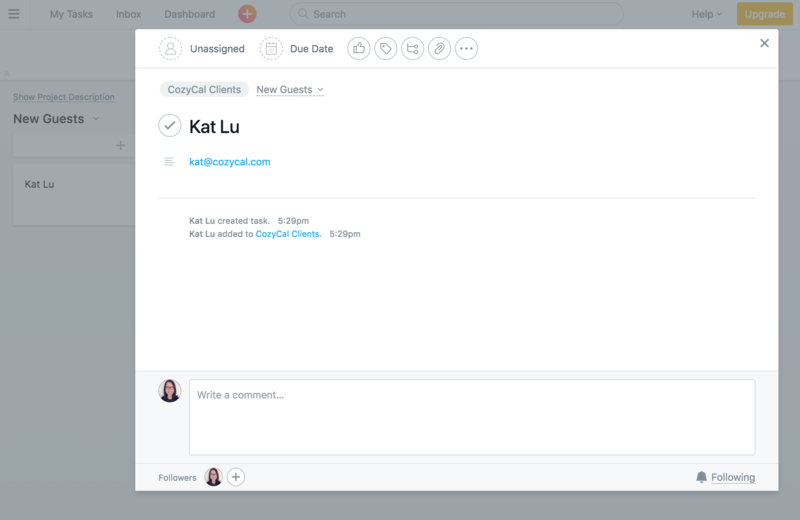 In this case, you can use Asana to track any new guests who are scheduling events with you. 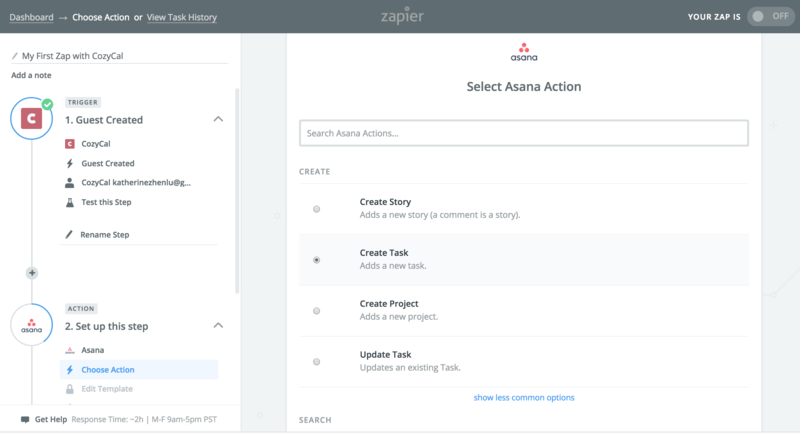 You can create a client list for new guests, and then new contacts will be automatically added to your Asana board after the zap is completed. Step 4: Finish and turn on the zap. 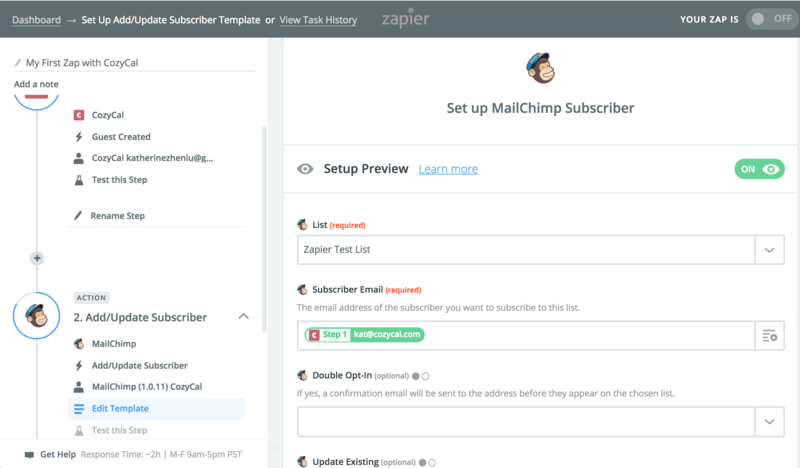 New guests will appear in your MailChimp mailing list automatically. 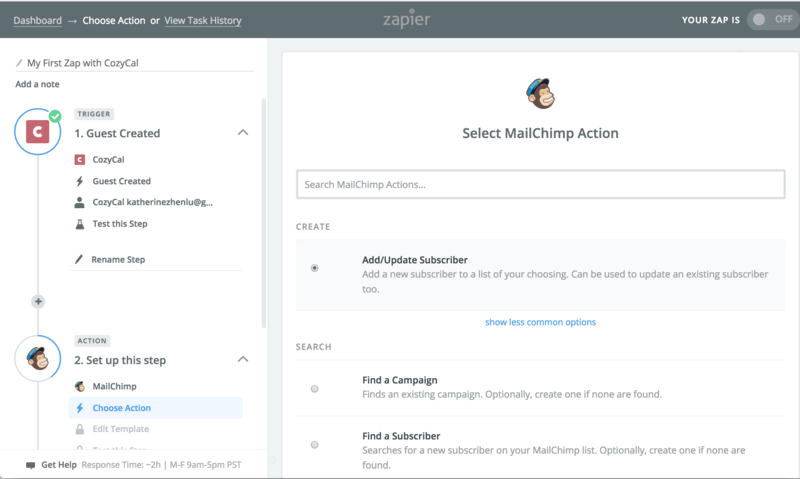 You can watch a step-by-step tutorial guide to zap CozyCal with MailChimp by clicking here. Now you can see all the zaps you have created on your Zapier's dashboard. You can easily turn the zaps on and off anytime. These four zap recipes we are sharing with you here are only examples of how you can automate one-step tasks through integrating CozyCal with other apps. 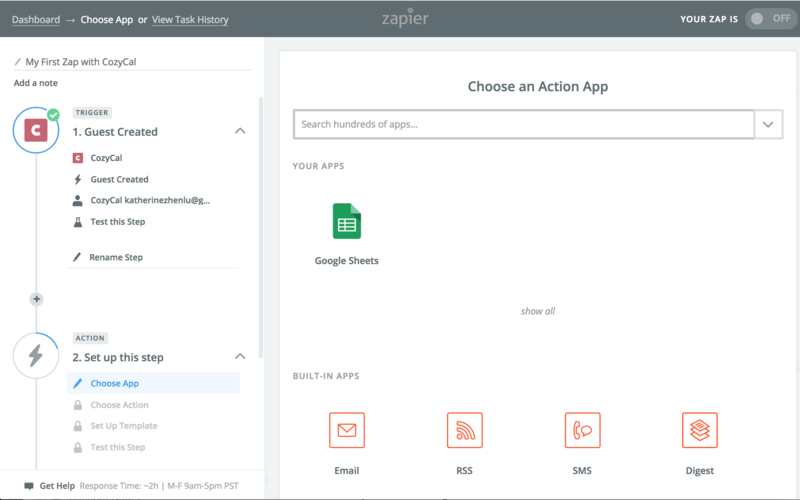 There are hundreds of zaps you can create depending on what apps you use to run your business.